Hi All and Happy Summer! This season is by FAR my favorite each year because 1. The sun is always out, 2. The weather is warm, and 3. I can wear flip flops and summer dresses every day. Aside from all those obvious perks there is also the advantage of having my pick of tons of fresh delicious produce in the store. Here in California I often forget what a big deal this is because, aside from fluctuations in price; I get my choice of quality fruits and veggies year round. However when ever berries start popping up for a $1 a pound and, ears of corn are piled high in the store I remember the fourth reason why summer is so awesome, good food! 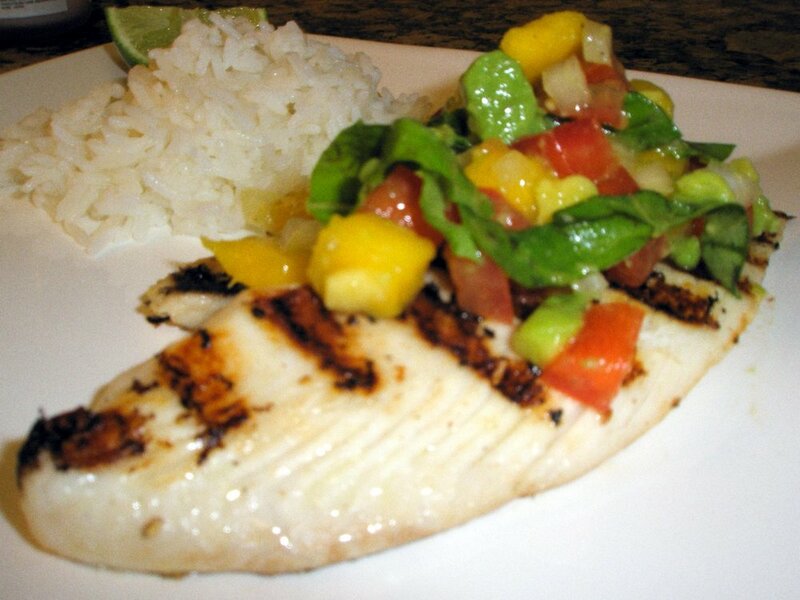 Today’s recipe for Grilled Mahi-Mahi and Mango-Basil Salsa highlights the fresh and independently delicious flavors of peak season produce and is a snap to make. Tender flaky tilapia is topped (or in my case smothered) with a salsa of fresh mango, avocado, tomato, basil, and onion to create a flavor profile that screams fresh and delectable. So if you are ready to embrace the bounty of ripe fruits & veggies available at your local grocers hurry up catch a fish (or patronize whole foods) and get cooking! Prepare a grill to medium-high heat. 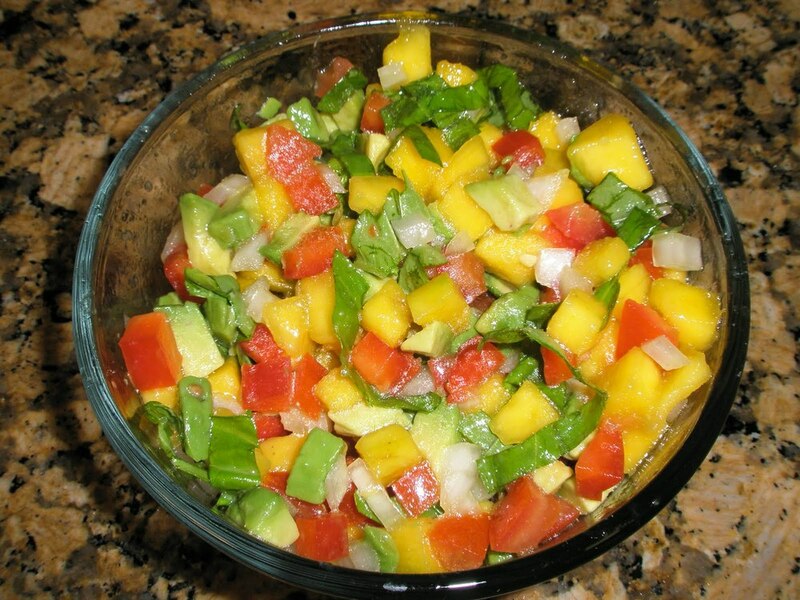 Gently combine the avocado, mango, tomatoes, basil, 1 tablespoon oil, and 1 tablespoon lime juice in a large mixing bowl. Season salsa to taste with salt and pepper and set aside at room temperature, gently tossing occasionally. Place fish fillets in a 13x9x2″ glass baking dish. Drizzle remaining 2 tablespoon oil and 2 tablespoon lime juice over. Season fish with salt and pepper. Let marinate at room temperature for 10 minutes, turning fish occasionally. Brush grill rack with oil. Grill fish until just opaque in center, about 5 minutes per side. Transfer to plates. Spoon mango-avocado salsa over fish. Serve alongside steamed rice and extra drizzle of lime juice. Previous: Previous post: Do you like Sriracha?